The “Power of Partnership” took hold this year at the 99th Scientific Assembly & Annual Meeting of the Radiological Society of North America (RSNA 2013). In her Keynote Presentation, RSNA President Sarah S. Donaldson, MD, described this concept behind the new vision of the radiologists’ role in the continuum of care; one which reinforces internal partnerships with colleagues and fortifies external ones with referring physicians and patients. At its peak, 53,169 radiological professionals, exhibitors, guests, and other attendees filtered through the conference rooms and exhibit halls at RSNA 2013 to sharpen their knowledge on advanced clinical techniques and learn about new technology emerging in medical imaging. Some of the more notable clinical studies presented at RSNA 2013 showed results that breast tomosynthesis increases cancer detection,demonstrated how multiparametric magnetic resonance (MR) imaging helps in early detection of prostate cancer recurrence, and described the use of hematopoietic stem cells for cancer treatments prior to chemotherapy and radiation therapy. There were also several innovations in technology showcased on the exhibit hall floor. Some of these included a new MR sequence designed to enable correct contrast imaging in dynamic liver MR imaging, with full 4D coverage, a new software that generates a 2D image from a 3D mammography data set, and the use of spectral computed tomography (CT) using color to identify the composition of an image in nuclear medicine. In this edition of Technology Trends, we provide a comprehensive review of the latest introductions in medical imaging technology presented at RSNA 2013 annual meeting. Carestream Health presented its digital breast tomosynthesis (DBT), an optional module for existing Vue Mammo workstations or VuePACS designed to streamline reading workflows by displaying DBT exams and images from other mammography modalities on its VueMammography Workstation. 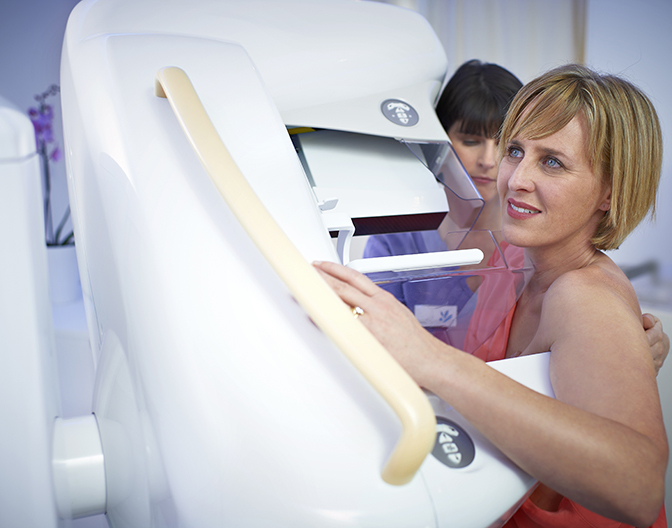 The specialized tools provide automatic positioning of DBT and mammograms to eliminate manual manipulations; automatic “same sizing” of DBT and mammograms for comparing changes in anatomy; and concurrent magnifying glasses providing close-up comparison of pathology across multiple views and procedures. DBT exams can be viewed in cine mode or by scrolling. TheDBT module can enhance workflow by allowing healthcare providers to store, route, display, and query/retrieve DBT exams from DICOM-compliant acquisition devices. 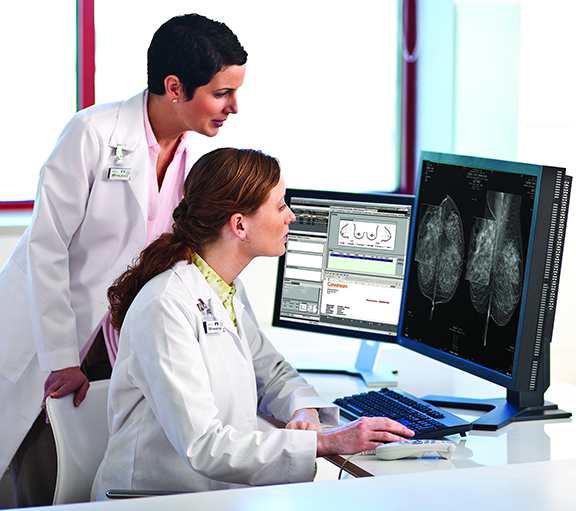 The Vue Mammography Workstation displays traditional mammograms, breast ultrasound, breast MRI and general radiology exams to equip radiologists to work efficiently from a single desktop. EchoPixel provides True 3D technology, which uses holographic virtual body parts from a patient’s CT or MRI to enable radiologists to overcome the limitations of current offerings based on 2D technology in diagnostics, surgical planning and image guided treatment.EchoPixel’s proprietary software is being tested at such luminary centers as UCSF, Stanford, and the Cleveland Clinic. FUJIFILM Medical Systems featured its Aspire Bellus workstation, part of its breast imaging solutions designed to improve image quality, streamline workflow and enhance patient outcomes. The workstation offers quality images with display speed of detailed image data,customized reading protocols, intuitive image layout, toggling between current and prior images known as Intelligent Temporal Comparison (ITC), and one-click operation for image processing adjustments. Fujifilm also showcased the Amulet Innovality, which includes the ability to do breast tomosynthesis studies. Once commercially available in the United States, upon receipt of FDA clearance, the system will be named ASPIRE Cristalle. The system has been designed to enhance patient comfort and the patient experience during annual exams. Gamma Medica debuted an updated version of its LumaGEM Molecular Breast Imaging (MBI) system. LumaGEM is an advanced,high-resolution imaging system optimized to detect tumors as small as 5 mm in women with difficult-to-image breasts, particularly mammographically dense breasts. The technology measures and images the distribution of radionuclides by means of photon detection in order to aid in the evaluation of lesions in the breast tissue. The dual head technology identifies tumors in dense breast tissue where findings are inconclusive or even negative with film-based and digital mammography. LumaGEM is able to detect breast cancers as small as 5 mm that may be missed by mammography. 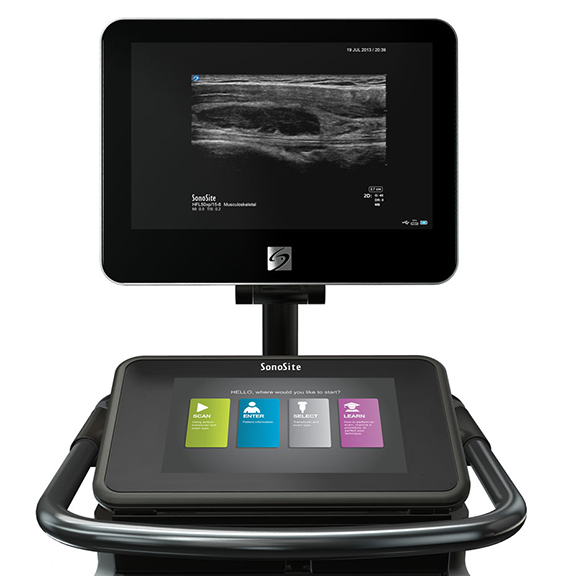 GE Healthcare highlighted the Invenia ABUS (automated breast ultrasound system) featuring new automated compression tools for enhanced workflow and ergonomics. The breast ultrasound system provides physicians with a new way to look at dense breast tissue that can allow them to improve breast cancer detection by up to 35.7% over mammography alone. The Invenia ABUS features advanced automation technology designed for reproducibility, ease of use and both patient and operator comfort. With new tools like Compression Assist and Reverse Curve, healthcare providers can capture whole breast, 3D volumes of clinical images in less time compared to previous versions of the technology. GE Healthcare is the sole manufacturer with an FDA-approved ultrasound system for breast cancer screening purposes. GE’s latest features on the LOGIQ S8 general imaging ultrasound system includes Breast Measure Assistant tools to help enable clinicians to shorten exam time for measurement intensive exams. It measures lesions quickly with an auto-contour feature that helps reduce keystrokes. The OB Measure Assistant is a similar tool for use during fetal measurement exams. Breast and Thyroid Productivity Packages help improve efficiency and standardization of lesion reporting by automating the labeling, measuring, and description of lesions to enhance both efficiency and clinical confidence. Hologic showcased its new C-View 2D software option designed to generate a 2D image from a 3D mammography data set without the need for a separate 2D x-ray exposure. C-View software is designed to offer radiologists and patients a number of benefits including a reduction in x-ray exposures leading to shorter exam times (less than 4 second scan per view), and increased patient comfort from the shorter compression time. Hologic’s 3D mammography exam using C-View software is a lower dose mammogram than the average U.S. 2D mammogram and yet it includes all the benefits of a combined 2D and 3D mammography exam. Hologic’s new ImageChecker CAD 10.0 software for C-View 2D images is currently in review with the FDA. Also on site was Hologic’s Affirm, a 3D-guided mammography biopsy option designed for the localization and accurate targeting of regions of interest—especially for targeting lesions not detected in 2D imaging or when using other modalities. This new biopsy technique is designed to provide numerous advantages over traditional stereotactic biopsy procedures, including faster lesion targeting and reduced patient procedure time. The Affirm system is preprogrammed for use with the Company’s Eviva and ATEC vacuum-assisted breast biopsy devices. Matakina launched VolparaDose and VolparaAnalytics, two new volumetric breast imaging products built upon its globally used, multi-vendor VolparaDensity Volumetric Breast Density Software. VolparaDensity is used by radiologists to objectively assess density from both digital mammography and to tomosynthesis images and help evaluate who might benefit from additional screening. Highly correlated to breast MR assessments, VolparaDensity automatically generates an objective, automatic measurement of volumetric breast density and aFDA cleared BI-RADS breast density category. VolparaAnalytics automatically extracts information about the x-ray physics parameters used, records mammography, and technologist identifiers, and computes various novel metrics from that data, including volumetric breast density and pressure. Real-time alerts and reports can demonstrate, for example, whether one technologist is compressing too much, or if one mammography unit is operating differently to the others. This comparative information can help determine whether additional training or re-calibration is required. The Philips MicroDose SI system is a full-field digital mammography (FFDM) system supporting future Single-Shot Spectral Imaging applications. MicroDose SI uses direct, digital photon-counting technology, enabling high-dose efficiency to conduct exams with low radiation dose without compromising image quality. MicroDose SI provides the same low dose as the MicroDose with an increase of up to 11% of the technical image quality (As measured with the CDMAM phantom for 0.1 mm disk diameter). MicroDose SI provides industry-leading 50μm resolution and has shown great clinical performance, even in dense breasts. Future software applications like Spectral Breast Density Measurement (pending 510(k)), which will build upon the MicroDose SI technology, is the first application Philips has developed to interpret the spectral data obtained from the MicroDose SI examination; it transforms the data into clinically relevant quantitative information. Seno Medical Instruments, Inc., providing opto-acoustic imaging as a tool to improve the process of diagnosing breast cancer, announced preliminary information from a feasibility study of its Imagio breast imaging device, suggesting that information from Imagio, beyond that available from traditional breast ultrasound, may be helpful in assisting physicians in their decisions whether to recommend biopsies for women with suspicious breast masses. Imagio combinesan imaging technology based on light-in and sound-out called “opto-acoustics” with traditional ultrasound. The opto-acoustic images provide a blood map in and around suspicious breast masses. Imagio does not use injectable contrast agents. Siemens Healthcare’s MAMMOMAT Inspiration PRIME Edition mammography system lowers patient radiation dose up to 30% without compromising image quality, replacing the standard scatter radiation grid with a new algorithm for progressive image reconstruction.Capable of identifying scatter-causing structures and calculating a corrected image, this new algorithm potentially enables complete use of primary radiation so physicians can achieve high-quality images using less dose. GE Healthcare introduced the Revolution CT, a 510(k)-pending CT scanner that captures motion free images of the human heart in just one beat. The system is designed to enable clinicians to clearly see specific areas of the heart that were previously compromised either by a patient’s movement, high heart rate, or a child’s inability to hold his or her breath. Revolution CT offers spatial resolution, temporal resolution, coverage, and low dose all-in-one. This convergence supports comprehensive cardiac exams with anatomic and functional information in just one heartbeat, even with challenging patients and higher heartrates; rapid, whole-brain stroke assessment at low dose; dynamic liver, kidney, or pancreas oncology workup personalized with perfusion and vascular flow analysis. The technology includes a 16-cm Gemstone Clarity detector for whole organ coverage, resolution at 230 microns for visualizing small anatomy, and a 0.28-second gantry designed and tested for up to 0.2-sec rotation speed. Combined with Snap-Shot Freeze motion correction technology, the system delivers 24-msec effective temporal resolution for high heart rate imaging without restrictions. GE emphasized the importance of low-dose and high quality CT imaging with its Discovery CT750 HD, a high-definition CT (HDCT).Discovery CT750 HD system is built with GE’s Gemstone detector FREEdom Technologies, designed to allow for intelligent motion correction to “freeze” coronary motion, enhance coronary visualization and obtain additional information on plaque material composition. New this year is kV Assist, which provides optimized personalized scan settings and applications with automated kV and mA selection. 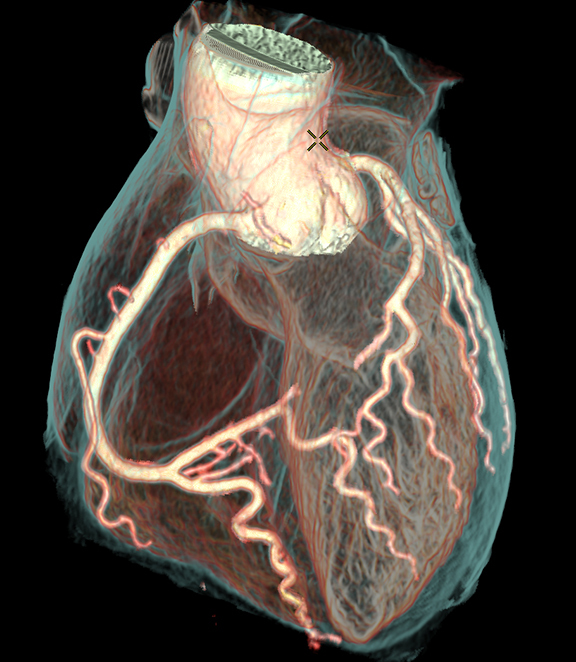 kV Assist combined with SnapShot Assist deliver the desired image quality at the lowest possible dose and workflow optimizations for efficient cardiac CT. 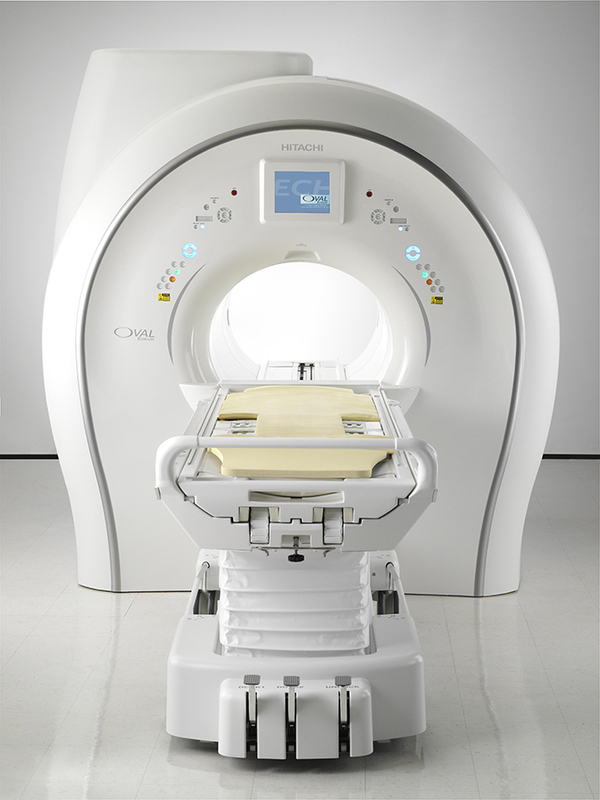 The Optima CT660 Freedom Edition also features GE’s exclusive Motion Freedom with intelligent coronary motion correction and is a platform that enables fast, high-performance imaging with emergency room capabilities and dose-reduction features. GE Healthcare highlighted 510(k)-pending ASiR–V, the next iteration of GE’s iterative reconstruction CT technology. ASiR-V combines the speed of ASiR with the capabilities of Veo full model-based iterative reconstruction, is designed to significantly reduce dose relative to filtered back-projection (FBP) for both body and head modes. It improves slow contrast detectability, spatial resolution and image noise, and has the capability to reduce low signal artifacts. Hitachi showed its Scenaria CT, the Hitachi workhorse, offering patient-friendly CT imaging that combines the latest lower-dose features with rapid workflow capabilities, easy patient positioning, and without diagnostic compromise. The 64-slice technology delivers dose efficiencies, superb image quality, and enhanced workflow to meet the needs of a wider range of imaging environments. The systems combine radiology and cardiology clinical capabilities in a feature-rich configuration ensures that SCENARIA provides extremely powerful clinical value. The Philips IQon Spectral CT system is the world’s first spectral-detector CT system built from the ground up for spectral imaging. IT uses color to identify the composition of an image without involving time-consumer protocols. In the same way that white light is made upa spectrum of colors, the X-ray beam used in CT scanners also consists of a spectrum of X-ray energies. With the development of a new spectral detector that can discriminate between X-ray photons of multiple high and low energies simultaneously, the IQon Spectral CT adds a new dimensions to CT imaging, delivering not only anatomical information but also the ability to characterize structures based on their material makeup within a single scan. Clinicians can interpret the conventional grayscale anatomical images, and if necessary, access the spectral information that was acquired during the same scan. The IQon Spectral CT system’s retrospective on-demand data analysis is made possible via Philips’ iPatient platform, allowing clinicians to easily experience the benefits of spectral CT routinely within traditional radiology workflows. Samsung Electronics America Inc. continues to build its presence in the radiology space by showcasing its mobile CT and SPECT solutions recently acquired by NeuroLogica. The BodyTom is a portable, full body, 32-slice CT with an 85-cm gantry and 60-cm field of view. The battery is transportable and is compatible with PACS, surgical navigation, electronic medical records, and planning systems. The system is designed for use in the clinic, ICU, OR,and emergency/trauma department. Also on display was the CereTom 8-slice small-bore portable CT scanner that delivers high-quality, noncontrast, angiography, and contrast perfusion scans. Samsung’s imaging portfolio includes a mobile SPECT system, inSPira HD SPECT, a batter-powered, high-resolution, portable SPECT designed for brain imaging. Its clinical applications include imaging for epilepsy, stroke, Parkinson’s and Alzheimer’s disease. The systemis designed for use in the clinic, ICU, OR, and emergency/trauma department. 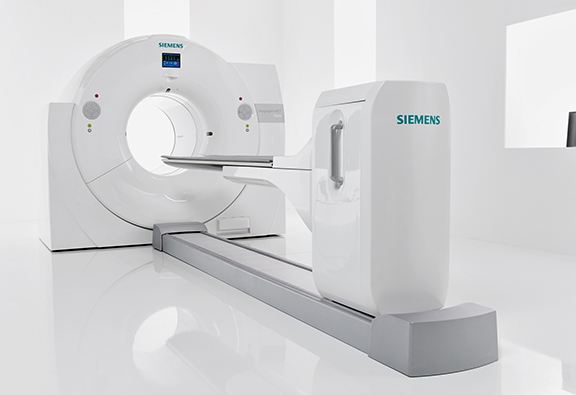 Siemens debuted its latest dual-source CT, SOMATOM Force, which is designed to enable considerably faster imaging, more precise diagnoses, and the possibility to achieve significant dose reductions. The system extends advanced CT imaging capabilities and dose-reduction features to young patients, those suffering from renal insufficiency, the seriously ill, or obese. SOMATOM Force has an acquisition rate of 737-mm per second, so an entire chest and abdomen study can be performed in just one second, meaning that patients do not need to hold their breath. Because of the acquisition speed, even patients with high heart rates can be imaged without disruptive motion artifacts. In research use, SOMATOM Force has delivered diagnostic-quality images at a low dose for a patient with a 90 beats-per-minute heart rate, with no use of beta blockers to slow the heart rate. Another advantage in chest imaging is the system’s enlarged 50-cm field-of-view in Turbo Flash Mode, which has an acquisition rate of almost 400-mm per second, allowing depiction of the entire chest in roughly one second. SOMATOM Force is able to achieve dose values of up to 50% lower radiation dose vs. that of comparable CT systems, which is attributable to two special spectral filters known as Selective Photon Shields that optimize the X-ray spectrum to significantly improve the air/soft-tissue contrast. Early research examinations performed with SOMATOM Force show achievable dose values of 0.1 mSv for a lungs can. 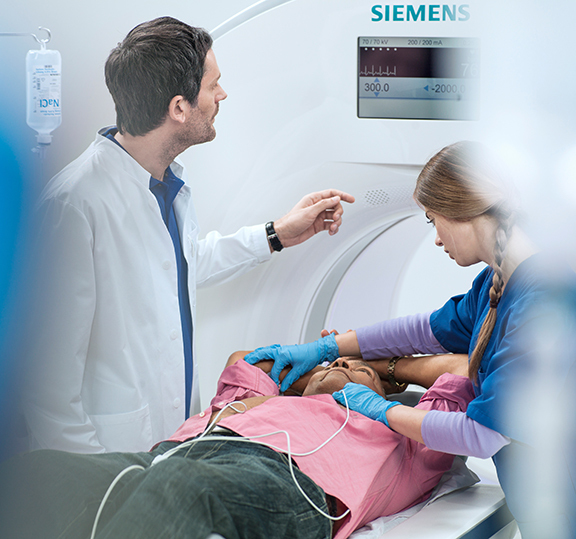 Engineered to drive efficiency and reduce costs, Siemens also introduced the new 16-slice and 32-slice configurations of Siemens’ SOMATOM Perspective family of computed tomography (CT) scanners. In addition to being suitable for routine oncology scans as well ashead, neck, lung, and abdominal imaging, the 16-slice SOMATOM Perspective can help ensure that pain-relieving analgesics are delivered to the correct location during surgery. The 32-slice configuration is designed to provide more detailed imaging for bone fractures, inner ear examinations, and vascular applications. Both configurations of the SOMATOM Perspective feature the SAFIRE (sinogram affirmed iterative reconstruction) algorithm, helps user reduce radiation dose. Toshiba Medical Systems focused on the Aquilion CT product line’s new automated workflow enhancements and clinical applications, including: SURECardio Prospective (510(k) pending)gating software application that combines high-speed helical scanning with gated intermittent exposure to further reduce dose during cardiac examinations; Variable Helical Pitch (vHP)* scanning that allows non-stop helical scanning while performing multiple exams; and optional higher-weight-capacity patient couch (WIP)(up to 650 pounds) to meet the needs for imaging a wide range of patients, from bariatrics to pediatrics. The company also featured Adaptive Iterative Dose Reduction 3D (AIDR 3D), its third-generation iterative dose reconstruction software that incorporates system enhancements by reducing radiation dose compared to conventional scanning. AIDR 3D can also be integrated with SUREExposure 3D, software that calculates the minimum radiation exposure required for every exam. SUREExposure 3D adjusts the dose for each patient based on a preset, targeted level of image quality, making it easy to use on all exams. AIDR 3D comes standard on all new Aquilion CT systems: Aquilion ONE ViSION Edition, Aquilion ONE, Aquilion Premium, Aquilion PRIME, Aquilion RXL and Aquilion LB. GE Healthcare introduced the Discovery Interventional Guidance System (IGS) 740, a 510(k)-pending mobile X-ray angiography system with a 41x41 centimeter detector. The rail-free design aims to allow healthcare professionals ample access to the patient while freeing clinical teams from the constraints of fixed ceiling-mounted system rails. 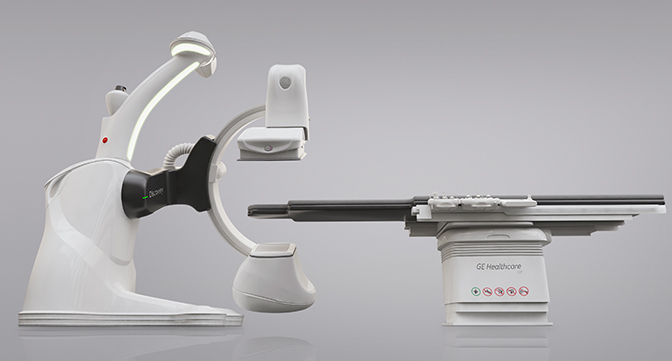 Its wide bore C-Arm and dedicated arm-imaging positions are designed to enable ease in imaging the anatomy of interest, and full patient access from left or right. By eliminating the ceiling rails, installation is simplified. Philips highlighted AlluraClarity, its live image-guidance system in the US. The AlluraClarity system with ClarityIQ technology provides high-quality imaging for a comprehensive range of clinical procedures, achieving excellent visibility at low X-ray dose levels for patients of all sizes. ClarityIQ technology includes real-time image processing developed based on the latest parallel computing technology.Benefits include noise and artifact reduction, also on moving structures and object; image enhancement and edge sharpening; and automatic,real-time patient and accidental table motion correction on live images. ClarityIQ is available as an upgrade for the majority of Philips’ installed base of monoplane and biplane interventional X-ray systems. Another IR introduction is Philips Ingenia MR-OR solution for intraoperative neurosurgery. Philips is expanding MR imaging into the therapy area. One of the new solutions in this field is the next generation MR-OR solution for intraoperative neurosurgery with Ingenia. AnMR-OR suite for intraoperative MRI supports resection procedures that can save precious time for both surgeon and patient. When intraoperative MR reveals incomplete resection, for example, the resection can be completed in the same procedure and can reduce the need for subsequent surgery. When Philips introduced Ingenia, the first digital broadband MR system, the next generation intraoperative MR-OR was conceived as well. 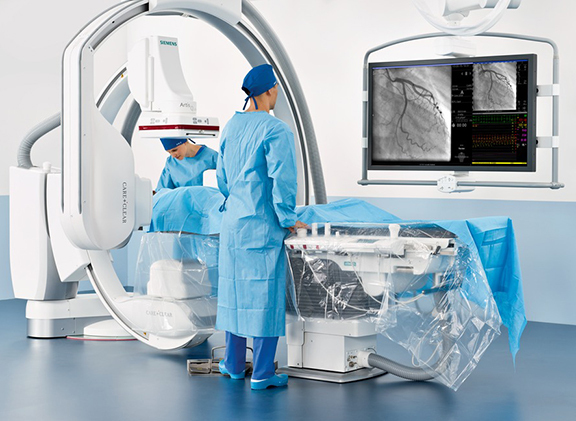 Siemens demonstrated its Artis Q and Artis Q.zen angiography system families, which feature new X-ray tube and detector technology designed to improve minimally invasive therapy of diseases such as coronary artery disease (CAD), stroke, and cancer. The new X-ray tube in both the Artis Q and Artis Q.zen can help physicians identify small vessels up to 70% better than conventional X-ray tube technology.The Artis Q.zen combines this X-ray source with a new detector technology that supports interventional imaging in ultra-low-dose ranges to patients, doctors, and medical staff. The Artis Q and Artis Q.zen system families offer software applications for the treatment of CAD, using the new integrated IVUS (intravascular ultrasound) map application, which automatically and precisely co-registers IVUS images and angiography images, adding detailed IVUS data such as vessel, lumen, and wall structure. CLEARstent Live allows the cardiologist to image stents with motion stabilization in real time by freezing motion in the region defined by the balloon markers. Advanced Data Systems (ADS) introduced a new patient communications portal for its MedicsRIS (radiology information system). The portal will enable patients to contact an imaging center, access a full range of forms, and receive exam instructions and results. It offers an important new convenience to patients as well as efficiencies to radiology practices and referring physicians. When patients log on, request an appointment, and prior to the visit, securely complete all necessary forms online, saving significant office time. Information is stored directly into the imaging center’s MedicsRIS system. Patients also can be provided with detailed, downloadable exam preparation instructions. Following the procedure, the MedicsRIS portal will also make radiology reports available for downloading by referring physicians and any other authorized user. Agfa HealthCare introduced the next generation (works in progress) of its MUSICA (Multi-Scale Image Contrast Amplification) imageprocessing software with new technology improvements designed to enhance both image quality and workflow for radiographers and radiologists. MUSICA automatically handles all image processing, independently of body part and dose, optimizing the final image quality without the need for any human intervention or special training. No input is required regarding which body part has been imaged, radiographic projection, patient position, the presence of contrast material, or anything else. All parameters needed to produce an optimized output image are derived or calculated by MUSICA from the input image itself. By automatically analyzing the characteristics of each image and optimizing the processing parameters, it saves time and effort. Agfa HealthCare also featured its enterprise image vendor-neutral archive VNA. ICIS is designed to enable creation, consolidation,integration, and sharing of the comprehensive medical imaging record throughout the continuum of care, thereby improving physician awareness and collaboration for better informed patient treatment decisions. The comprehensive set of services offered include ICIS View,enabling easy-to-access images to any point of care, with minimal infrastructure requirements. The company will also showcase ICISVNA, which provides intelligent archive and distribution services for multidisciplinary images, regardless of origin. Barco featured its flat-panel displays, including the Coronis Fusion 6MP LED, which is designed to reduce eye strain. Optimized glass,intelligent sensors and other patented technologies ensure crystal clear images to enable fast, accurate diagnosis. More than 13,500 Coronis Fusion 6MP DL display systems are installed around the globe. Also on view was the Barco Mammo Tomosynthesis 5MP, the only digital mammography display that has been indicated by the FDA specifically for breast tomosynthesis. Featuring up to 4X brightness and double the lifetime of other mammography displays, it also presentsup to 15% increased conspicuity of small microcalcifications. BRIT Systems teamed up with Medic Vision Imaging Solutions, Ltd. to offer a new cloud-based service supporting low-dose CT (LDCT)lung cancer screening. The service allows any radiology department/practice to perform LDCT lung screening and obtain diagnostic-quality images without having to purchase and implement new Iterative Reconstruction technology at their site. The new service is based on MedicVision’s SafeCT Iterative Image Reconstruction system and BRIT’s Roentgen Cloud. With this service, LDCT lung images are securely forwarded via https to remote cloud-based SafeCT servers for immediate transformation into diagnostic-quality images. Processed images are immediately sent back to the customer’s network via the secure link and forwarded to the customer PACS. The processed images remain accessible via Roentgen Cloud to the provider, and optionally, to the patient. 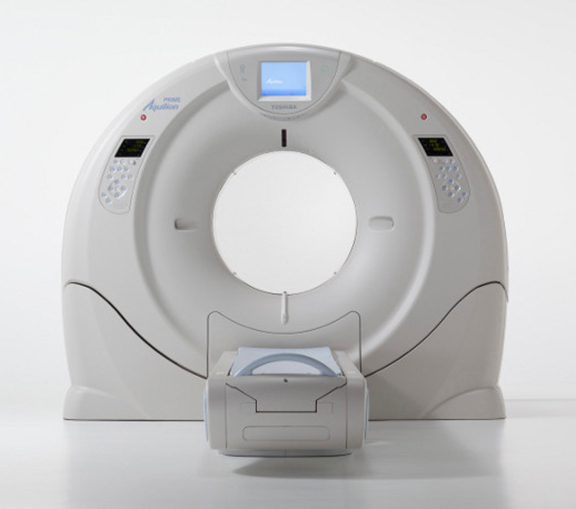 The service is available at a pay-per-scan fee for CT scanners of all major vendors. BRIT Systems also announced it is partnering with Radiolopolis to image enable the launch of Consult Me, a new peer review consultation capability on the Radiolopolis Radiology Network. As part of the partnership, Radiolopolis will utilize BRIT’s Roentgen Cloud and Web-Works viewer as the infrastructure to facilitate image viewing and sharing on the Consult Me consultation platform. The new consultation platform will provide radiologists with an opportunity to obtain virtual peer review of difficult cases or provide other consultation as needed. 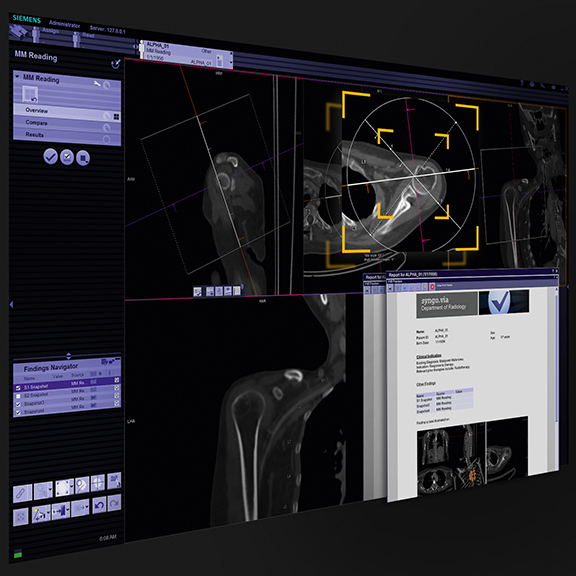 Carestream showed a new generation of its Vue PACS platform (as a work in progress) that is designed to create productivity-enhancing capabilities for radiologists and referring physicians. Embedding access to key image data using links within the report, which merges images into the reporting workflow and an innovative teleradiology module that gives remote radiologists access to prior exams and automatically sends radiology reports to the requesting facility—all without requiring significant investment by healthcare facilities or radiology/teleradiology groups. The new PACS also will offer an optional Vue for Teleradiology module (also a work in progress) designed to enable efficient off-site reading and reporting by remote radiologists for multiple healthcare facilities. The new module will employ Carestream’s Vue Connect platform, which will enable radiologists to access worklists from unaffiliated healthcare providers and automatically deliver reports back to each facility. 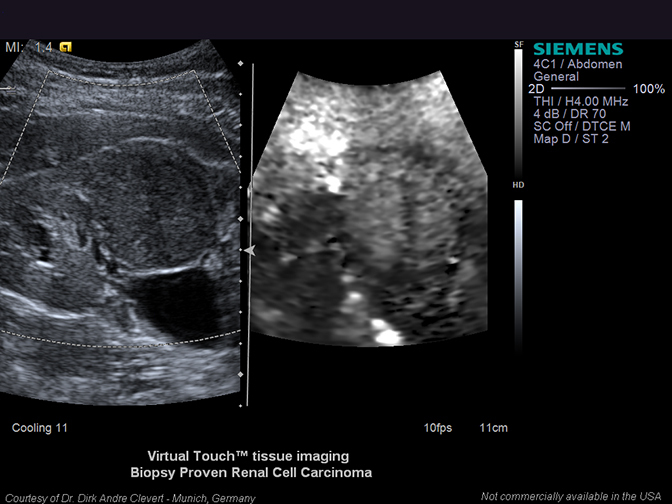 Carestream’s Vue Motion zero footprint image viewer will be used to transfer the imaging studies. Vue Motion currently enables access to imaging studies and radiology reports on mobile devices, such as an iPad. Calgary Scientific Inc. highlighted updates to ResolutionMD, an enterprise-wide image and report viewing solution that provides one simple interface for practitioners to securely access information from multiple archives in real-time. ResolutionMD is accredited by theFDA for diagnosis on web and iOS mobile devices and was first to be cleared for Android devices earlier this year. Claron Technology, Inc. announced extended modality support for its Nil universal zero-footprint medical viewers at RSNA. The Nil viewer family includes NilShare, for referring physicians, and NilRead, newly FDA-cleared for diagnostic use. Also new are the high-definition MPEG-4 videos as well as all common image formats including JPEG, TIFF, and PNG. The viewers also now support full cross-enterprise document sharing (XDS) integrating and healthcare enterprise (IHE) profile, including comprehensive Health Level 7 (HL7)clinical document architecture (CDA) documents. The Nil viewer family is optimized for cache less integration with remote archives, including PACS and VNA, streaming data without caching it. 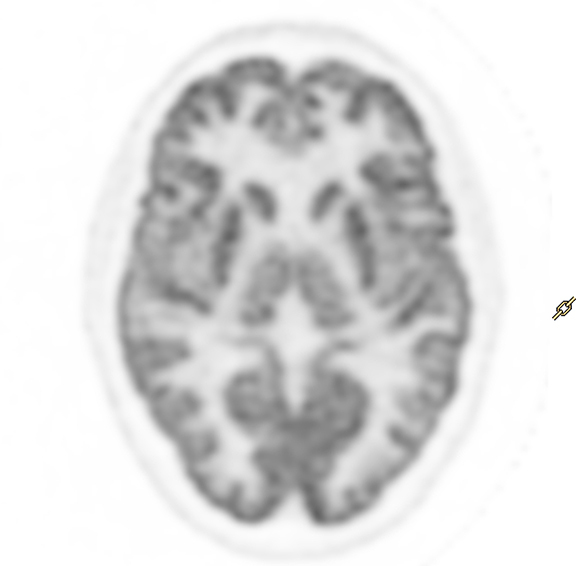 Claron also debuted version 3.0 of Withinsight Framework (WIF), an advanced platform that accelerates development of medical image visualization applications. WIF 3.0 is the next-generation platform that includes enhancements in rendering, segmentation tools, and overall performance, providing Claron’s partners with advanced technology to meet their evolving needs. Claron also showcased several clinical engines for liver segmentation, lesion segmentation, and spine landmark mapping, as well as time series and multi-modality registration. CoActiv debuted version 3.0 of its flagship product, EXAM-PACS, and showcased its advanced vendor neutral technology, cloud options, and new user management tools, such as EXAM-CLOUD Quad-Redundant Archiving, a cloud-based storage solution. 4.2 update, the telemedicine feature brings a real life telepresence to the physician room. Instead of sending patient files and x-rays to an additional doctor for a second opinion, doctors can now call upon fellow physicians to review and go over the files for a second opinion while discussing their studies. Not only are requests and reviews in real-time but they are also HIPAA compliant through the telemedicine platform. FUJIFILM unveiled Synapse VNA, a patient-centric vendor neutral archive (VNA) technology that catalogs and maintains the data in a patient centric model allowing a single access point for EMRs and other systems. Synapse VNA will enhance image management, streamline workflow, reduce costs and, most importantly, improve patient care. It can be implemented within any environment and offers dataaccess and availability. The archive allows sharing and consolidation of the storage and provides secure access across all authorized users.Synapse VNA provides a unified viewing experience for the VNA DICOM and non-DICOM data. The VNA is part of the Synapse® Portfolio, which unifies data from the PACS, RIS, Cardiovascular, VNA and Cloud Services, and organizes it by patient, in one system. Hitachi highlighted the Hitachi Clinical Repository (HCR), a vendor-neutral archive with the ability to aggregate all digital medical images, electronic health and medical records, and the associated metadata related to patient care. HCR leverages data from existing departmental PACS, as well as existing hospital information systems. It answers the challenge of consolidating and integrating multiple imaging departments into a single, searchable and sharable image repository. iCAD featured its suite of Computer-Aided Detection (CAD) and advanced imaging solutions, including the PowerLook Advanced Mammography Platform featuring iCAD partner Mātakina’s VolparaDensity volumetric breast density assessment software, an FDA-cleared technologic advancement providing volumetric breast density measurements that correlate to the BI-RADS breast density category to assist in interpreting digital mammograms. The technology expands on iCAD’s SecondLook Digital algorithm and the CAD metrics feature provides a robust set of clinical decision support tools to aid in mammography screening. The company also showed VeraLook, a CAD solution for virtual colonoscopy (CTC) is designed to enhance clinician accuracy and effectiveness by improving detection of colonic polyps. Shown to be effective in the detection of colonic polyps, iCAD’s VeraLook CAD solution is designed to integrate with specialized CTC reading environments to streamline the reading process and improve clinician accuracy,productivity, and workflow. ImagingElements, a provider of cloud-based Meaningful Use solutions for radiologists, has integrated its Meaningful Use platform with the Radisphere cloud-based radiology technology platform. ImagingElements provides a certified EHR service called Element MU to assist radiology practices in collecting and attesting to Meaningful Use objectives. ImagingElements also launched its ElementPt solution, a cloud-based patient engagement platform that extends existing IT platforms into the mobile environment with patient reminders and the patient entry of meaningful use data in advance of their visit. ElementPt also supports patient access to health records; secure communications on mobile devices and practice level marketing activities. Intelerad Medical Systems featured its newly launched InteleConnect Patterns, an optional service built into the InteleConnect ReferringPhysician Portal that provides radiology groups with key analytics regarding their base of referring physicians. In analyzing the geographic,behavioral and acquisition data provided by InteleConnect Patterns, radiology organizations are able to gain a deeper understanding of where most of their referrals come from, the proportion of new versus returning visitors, how often they use the radiology group’s Referring Physician Portal, and which type of device they use to access it. Further navigational data provides key information about how referring physicians reach the portal, how they browse within the available features, such as viewing key images, and the amount time spent before exiting. Dashboards and reports can also be set up to monitor changes in traffic patterns or other statistics. MedCurrent Corp. promoted its Radiology Decision Support system. Integrated within PowerChart module of Cerner Corporation’s Millennium™ electronic medical record (EMR) ordering system, OrderRight provides optimal workflow for the ordering clinician, and is designed to enhance patient care planning and treatment, reduce inappropriate healthcare utilization, and lower costs. Medicalis showcased its upgraded Enterprise Worklist and Decision Support platform. The upgraded Enterprise Worklist with Actionable Reporting validates results in real time to reduce physician parroting, ensures fiscal and quality compliance and triggers critical findings while offering referring physicians streamlined radiology reports for rapid access. With a single Enterprise Worklist, every study across the enterprise and the information contained in the RIS or PACS is instantly available, leading to significantly increased efficiencies and helping to integrate the radiologist as a key component of the patient centric healthcare team. The Medicalis Decision Support Solution provides its full capabilities of integrated, targeted delivery, localization of content, process and policy control to the ACR Select content across the broad number of currently supported EMR/CPOE solutions. NEC Display Solutions of America displayed its recently FDA 510(k)-cleared 21-inch MultiSync MD210C2 medical-grade monitor, built for the displaying and viewing of digital images for diagnosis by trained physicians. The two-megapixel medical diagnostic display is designed to meet the needs of healthcare facilities requiring consistent and accurate medical imaging using PACS. MultiSync MDSeries models are factory calibrated to the DICOM grayscale function for luminance and include a small, tri-stimulus front sensor to maintain a calibrated brightness as well as an ambient light sensor that automatically adjusts the display’s brightness based on existing lighting conditions. The all-digital connectors, including DisplayPort and a new two-port USB hub, enable advanced connectivity for any typeof workstation. Another new display from NEC was the 24-inch MultiSync MD242C2 referral-grade, widescreen display for diagnostic review applications in healthcare organizations. The 2.3-megapixel, 24-inch display with IPS panel is designed to provide precise color reproduction and wide viewing angles. Factory-calibrated uniformity control provides accurate imaging across the screen. The display includes out-of-the box calibration to the DICOM grayscale display function for luminance. An integrated front sensor constantly monitors and adjusts brightness to maintain the factory DICOM GSDF calibration. The MD242C2 also includes a human presence sensor that can automatically dim the screen to conserve power and display life as well as a Quick QA function for checking DICOM conformance without a computer. OneMedNet Corp. launched the BEAM Women’s Health Image Exchange service, a low-cost service enabling breast-imaging centersand radiology departments to quickly transfer a patient’s mammograms to another care provider for comparison, consultation, or treatment and eliminate delays associated with conventional delivery methods. The peer-to-peer transfer technology BEAM deploys does not use a virtual private network (VPN) or cloud storage. It is most commonly used to exchange images between hospitals and institutional providers for trauma transfers, patient referrals, prior exam comparisons, and consultations with specialists. peerVue showcased new developments for its Qualitative Intelligence and Communication System (QICS), including expanded peer review, critical results communications and customized workflows. QICS is an intelligent workflow and communication solution that enables healthcare organizations to improve patient care and safety, while reducing risk and simplifying process. Philips introduced the iPatient, an advanced platform that delivers focused innovations to facilitate patient-centered imaging now and in the future. The solution personalizes patient-centric workflow that is built for iterative reconstruction techniques and high image quality at low dose levels, driving confidence and consistency. iPatient increases the ability to perform complex and advanced procedures with ease and efficiency. It offers a new way to work smarter, not harder, because users can plan the results they seek to achieve, not the acquisitions,and it is designed to support platforms like the Philips IQon Spectral CT.
Also featured was Philips’ enterprise network, the IntelliSpace Portal, links complex clinical domains, including radiology, oncology,neurology, cardiology and trauma. IntelliSpace Portal supports clinical performance with ease of use, through a vendor-neutral approach, and an intuitive PACS integration. 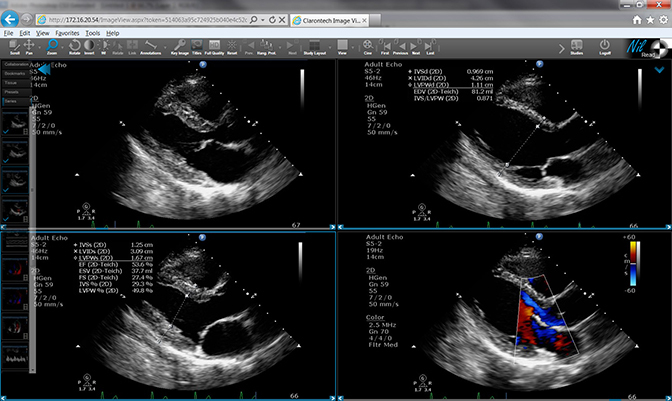 It features advanced visualization through a multimodality solution supporting CT, MR, nuclear medicine images and provides quantitative measurements converted into tables and graphs for easy reporting and new applications via a yearly“heart beat” update. Newly available are a set of advanced tools for neuro and cardiac with MR Cardiac, MR Neuro, CT TAVI planning andCT Acute Multi-Functional Review applications. As a managed service, IntelliSpace PACS allows clinicians to take advantage of new innovations, built-in scalability, proactive monitoring, automated remote disaster recovery, and software upgrades. Sectra highlighted advances in dose control with Sectra DoseTrack, a web-based dose monitoring solution that allows for monitoring of patient radiation doses and ensure that they are kept as low as reasonably achievable (ALARA). Sectra DoseTrack automatically collects,stores and monitors data from all connected modalities saving valuable time and facilitating analysis. Sectra DoseTrack is a certified ACR software partner, approved to submit a hospital’s dose data to the US Dose Index Registry. Sectra also highlighted several enhancement to its IT portfolio, including Highlights in the most recent version of Sectra RIS/PACS include a complete PACS reporting module with voice recognition and server-based volume visualization with time-saving diagnostic tools for vessel analysis and bone segmentation. Also new is the latest version of Sectra Open Archive, designed to improve the support for cardiology and endoscopy by enabling storage of file formats such as encapsulated PDFs and DICOM MPEG-4 videos. Sectra touted its cross-enterprise workflow features products and services that facilitate cooperation between hospitals on a point-to-point, regional or even national scale. Siemens showed its SyngoWorkflow, a RIS that that can function as the nerve center for the radiology department. It includes a new version of Powerscribe 360 for higher dictation accuracy and shorter report turnaround times. The database changed from SYBASE to Micro-soft SQL server, making it more convenient to perform database queries for business analytics, population health management and many other data that are important for accountable care organizations (ACO). A module developed for radiation dose management in collaboration with MedInformatics, the module also supports automatic insertion of dose information in the Radiology Report and forwarding dose information to the Dose Index Registry of ACR. An administration portal, web-enabled, to monitor key performance indicators in real time, such as waiting room times, modality use, report turnaround time and many others, configurable by the user. The latest innovation is the syngo.via General Engine, a new package of highly automated and standardized applications. The Anatomical Range Presets feature identifies individual regions of the body on images captured using computed tomography (CT) and magnetic resonance imaging (MRI), aligns the image projections accordingly, then selects detailed views to facilitate case preparation. For customers, this means greater efficiency and enables higher diagnostic confidence. The system is scalable to serve multiple users in a multi-hospital Enterprise, as seen often in ACO’s, and supports mobile devices for real-time collaboration between radiologists and referring physicians. The system also features structured reporting, required by ACO’s to enable semantic interoperability across multiple hospitals and to enable data mining. (The VA 30 version of syngo.via is not yet available in the United States). For secure viewing of reports and on-the-fly reading of images, Siemens is leveraging the Calgary Scientific Resolution MD viewer,which can be accessed from a standard Web browser and Apple or Android mobile device, sharing information with fellow physicians inside and outside the hospital. As a zero-footprint viewer, there is no installation of viewing software required, and images never reside on the viewing device. All this is essential to guarantee cybersecurity. When a viewing device with a zero-footprint viewer is lost or stolen, PHIcan’t be breached since the images and report are not stored on the device. Siemens also showed its latest version of syngo.plaza (VB10), Siemens’ agile picture archiving and communications system (PACS) and reading software, which provides tools to support users in achieving a fast, efficient reading workflow. The solution offers high-throughput reading with rapid image loading. Because syngo.plaza integrates seamlessly with Siemens’ syngo.via 3D routine and advanced visualization software, users can tap into the potential of syngo —accessing its applications through a common interface. In addition, the modular,scalable design is now tuned to deployment in large, multihospital ACO’s and for keeping costs down by using COTS IT building blocks while leaving room for future growth. (VB10 is not yet available in USA). TeraMedica highlighted its EverCore Vendor Neutral Archive (VNA), an open, Java-based system that is not dependent on proprietary server or storage technologies to store DICOM and non-DICOM objects. EverCore provides access to digital images to authorized users via an EHR, diagnostic workstations or clinical desktops. EverCore scales to meet needs ranging from those of a single department or clinic to those of multiple facilities with multiple imaging specialities. Visage Imaging featured a new set of new features for the Visage 7 Enterprise Imaging Platform work-in-progress capabilities, showcasing a dual-5 MP breast imaging workstation, with enhancements that include multiple-concurrent magnifiers, quadrant navigation, optimized mammography text overlays, and additional useful navigation and tools for digital breast tomosynthesis (DBT) interpretation. DBT layouts now include display of the 3D MIP, side-by-side with CC and MLO views. 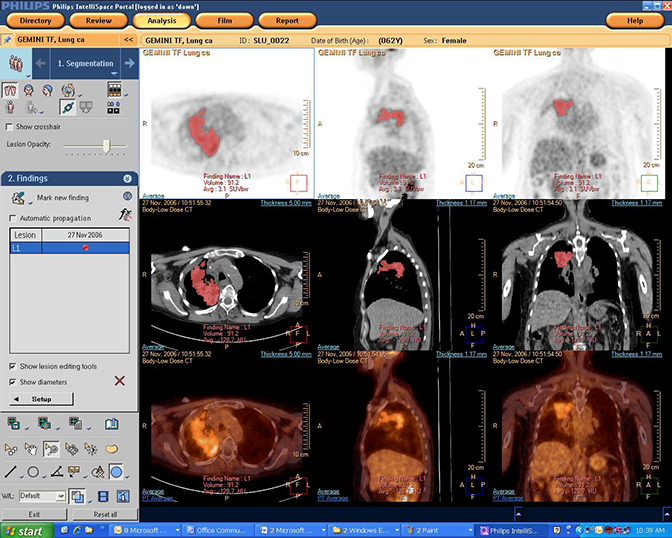 A natively multidimensional imaging platform, Visage 7 allows users to automatically hang and manipulate multidimensional volumesof current and prior imaging data. Also new are refinements for split-screen, current/prior hanging protocols and study layouts. These new capabilities allow the user to define a hanging protocol per display, which is particularly useful for multi-modality current/prior presentations. Vital Imaging announced that universal viewer, VitreaView, was selected as the viewer for all demonstrations in The Image Sharing atRSNA. The Image Sharing booth showcased developments in standards-based interoperability that enhances the quality, efficiency and safety of care in radiology. Vital’s role included the visualization of all image data included in the demonstration. VitreaView is designed for flexible deployment and leverages industry standards. It is also scalable, fault tolerant, and can be fully virtualized. VitreaView’s software-only platform is a zero download, zero foot print, browser and operating system independent solution. Users on different devices may access the functionality in VitreaView through multiple systems, including the Web or via EMR, EHR or portals. GE Healthcare introduced DV24.0, a software platform featuring applications including Silent Scan, on the Optima MR450w, OptimaMR450w with GEM, Discovery MR750, and Discovery MR750w with GEM scanners. With DV24.0, productivity improvements of up to30% compared to previous versions are possible with new features, such as the eXpress PreScan and Workflow 2.0, driving efficiency by greatly reducing the number of mouse clicks for technologists. DV24.0 also features enhancements to increase diagnostic confidence, such as improved 3D imaging through a real-time motion correction technique called PROMO that automatically compensates for head motion. Also included is FOCUS, designed to provide high-resolution, organ-specific diffusion-weighted imaging (DWI) and diffusion tensor imaging (DTI) for a small field of view. MAVRIC SL, a new technique designed for imaging the joints of patients with MR conditional implants, is another feature in DV24.0, particularly useful for musculoskeletal radiology. Hitachi highlighted its Echelon Oval 1.5T MR system, which features the revolutionary 74-cm oval bore design, allowing for greater positioning freedom to increase patient comfort while decreasing claustrophobia, improving workflow, and delivering high quality imaging. Also on display was the Oasis 1.2T high-field open MR that accommodates the broadest spectrum of patient types without sacrificing scan quality. From bariatric and claustrophobic patients, to pediatric and geriatric patients who crave the comfort of a loved one, Oasis delivers unparalleled patient comfort. 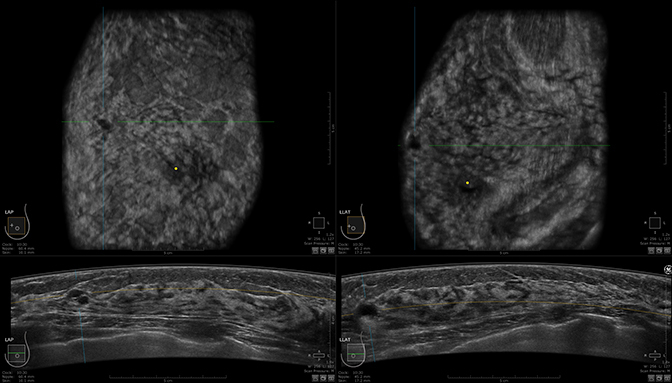 Hologic’s new MR software is designed specifically for imaging the breast and prostate. Hologic’s MultiView MR software offers advanced options for Hologic’s MultiView platform software. Hologic’s MR software is designed to provide real-time 4D (3D + time) imageprocessing, speed, flexibility and dedicated MRI algorithms for both breast and prostate diagnostic viewing. MultiView is a state-of-the-art imaging platform for MRI visualization and interventional guidance. Philips showcased Ingenia, a digital broadband MR solution, designed to produce stellar images in less time, redefining what clinicians can expect from an MR system. This is achieved with dStream, the digital broadband MR platform that improves MR signal digitization,delivering a high purity MR signal for increased SNR, combined with industry leading dS-SENSE acceleration and impactful imaging techniques like mDIXON and MultiVane that enable superb fast fat and motion suppression in almost all procedures. dStream enables clinicians to get more information, more consistently in the same amount of time by delivering premium image quality with digital clarity and speed. IMR is a solution for retaining CT image quality with low-contrast resolution and noise free images. This enhancement in low-contrast resolution is possible via Philips’ iterative reconstruction technique built on a knowledge-based model. With IMR, clinicians can reportedly achieve 60% to 80% lower dose and at the same time improve low-contrast. The coinciding benefits of IMR provide clinicians with the ability to see fine subtle differences that may have been missed in the past. These subtleties can be vital to the care of patients. Also new is the Ingenia MR-RT Oncology Configuration (not available in all countries), which allows radiation oncology departments to integrate MR imaging alongside CT in radiation therapy planning. This solution is designed to provide high-quality MR images acquired in the treatment position to boost accuracy in delineating tumors and critical structures. Siemens debuted new technologies designed to enable fast body magnetic resonance (MR) imaging for all patients. 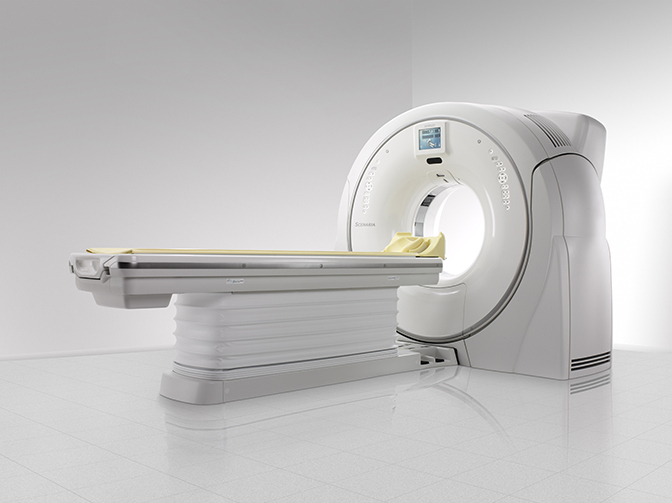 The technologies are available on the MAGNETOM Skyra 3T and MAGNETOM Area 1.5T MRI systems. The new StarVIBE MR pulse sequence is designed to enable free-breathing, contrast-enhanced liver imaging for patients (including patients who are old, very ill, or young)unable to easily manage breath-holding. Siemens’ new TWIST-VIBE MR sequence is designed to enable correct contrast imaging in dynamic liver MRI for all patients and lesions, allowing fast, robust liver imaging with full 4D coverage. The sequences StarVIBE and TWIST-VIBE will be available as the FREEZEit package. Also at this year’s RSNA, Siemens introduced its Quiet Suite of applications, which covers complete, quiet neuro and musculoskeletalMR examinations with a minimum 70% reduction in sound pressure and no compromise in image quality. Optimized to make MRI more comfortable for patients and to improve the comfort of sensitive patients such as children and the elderly, Quiet Suite will be available with the MAGNETOM Skyra 3T and MAGNETOM Area 1.5T MRI systems. GE Healthcare’s Q.Clear provides clinicians with a tool to quickly and confidently evaluate a patient’s response to cancer treatment.Q.Clear provides up to 2 times improvement in both PET quantitative accuracy (SUVmean) and image quality (signal-to-noise ratio). Over the last decade, PET image reconstruction technology has been designed to provide better image quality, reduced acquisition time and lower injected dose. Current PET iterative reconstruction technologies, such as Time of Flight (TOF) and OSEM, force a compromise between image quality and quantitation. GE Healthcare’s new 510(k)-pending Q.Clear technology shows the advantage of full convergence PET. The IQon Spectral CT system uses color to identify the composition of an image without involving time-consuming protocols. A new spectral detector can discriminate between X-ray photons of multiple high and low energies simultaneously. Philips’ IQon Spectral CT adds a new dimension to CT imaging, delivering not only anatomical information but also the ability to characterize structures based on their material makeup within a single scan. After a spectral CT examination, clinicians can interpret the conventional grayscale anatomical images, and if necessary, access the spectral information that was acquired during the same scan. The IQon Spectral CT system’s retrospective on-demand data analysis is made possible via Philips’ iPatient platform. According to the manufacturer, these improvements can ultimately be translated into high image quality, increased diagnostic confidence, improved treatment planning, and faster workflows. Siemens Healthcare’s new Biograph mCT Flow positron emission tomography/computed tomography (PET/CT) system (not commercially available in all countries) overcomes the limitations of conventional bed-based, stop-and-go PET/CT imaging with FlowMotion, a revolutionary technology that moves the patient smoothly through the system’s gantry while continuously acquiring PET data. BiographmCT Flow with FlowMotion enables imaging protocols based on the organ’s need, leveraging the industry’s finest4 resolution. FlowMotion expands accurate, reproducible quantification in all dimensions for precise disease characterization in therapy monitoring, while enabling physicians to offer as low as reasonably achievable (ALARA) dose to every patient.5 Additionally, the combination of a 78 cm bore with five-minute ultrafast scanning and a continuous sense of progress throughout the scan offers a more comfortable exam experience for the patient. Symbia Intevo, Siemens’ new xSPECT modality, combines the high sensitivity of single-photon emission computed tomography(SPECT) with the high specificity of CT. Completely integrating data from both modalities, Symbia Intevo generates high resolution and,for the first time, quantitative images for SPECT. The modality reconstructs both the SPECT and CT portions of the image using the high-definition CT frame of reference for precise, accurate alignment that facilitates the extraction and deep integration of medically relevant information. 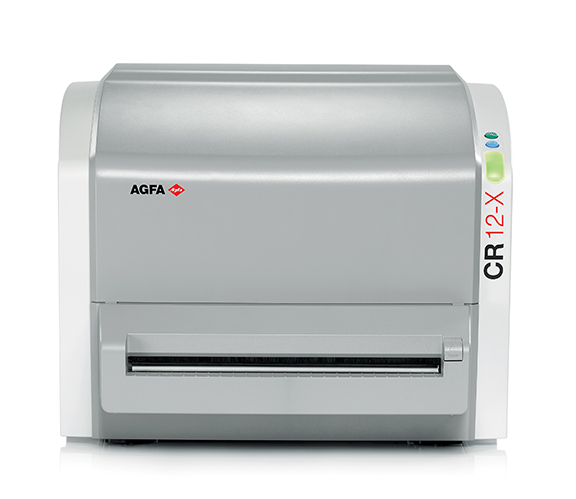 Agfa HealthCare launched the CR 12-X, a table-top computed radiography (CR) digitizer with a modular yet robust design, combining affordability with high image quality. The compact, table-top CR 12-X system has a single slot for 14x17 inch (35 x 43 cm) cassettes. This versatile solution is fitting for general radiography, orthopedic, and chiropractic practices, including those needing Full Leg/Full Spine application. With adjustable speed and a user-tuned workflow, the CR 12-X best meets the needs of each particular facility. Agfa’s newest direct radiography (DR) detector, the DX-D 35C, a 11 x 14-inch sized wireless panel. Orthopedic imaging can particularly benefit from the high spatial resolution for detail, and the excellent dose quantum efficiency (DQE) for potential dose reduction offered by this small DR panel. The DX-D 35C uses a Cesium Iodide (CsI) scintillator with twice the DQE of gadolinium-based detector technologies,and delivers the potential for lower dose. Combined with Agfa HealthCare’s NX workstation and MUSICA2 image processing, the panel produces enhanced contrast detail across the entire dynamic range. 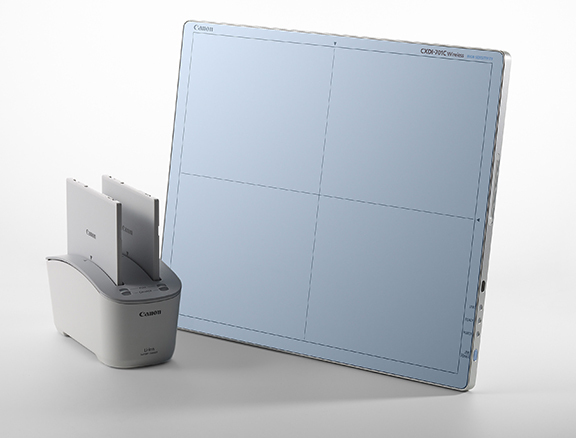 Canon U.S.A. Inc. introduced the new Canon CXDI-701C wireless digital radiography detector that weighs < 8 pounds and incorporates high-quality image sensors that provide high-resolution images at a low dose as a result of a 12-micron pixel pitch. Ideal for various diagnostic imaging areas and radiology rooms, and built for convenience and time savings, the DR panel incorporates an on-board battery charging capability for minimal disruption during operation. The RadPRO 40kw Digital Mobile X-ray System now includes the Enhanced Workflow Package, allowing users to seamlessly switch between image acquisition and third-party HIS/RIS software applications. In addition, technologists can query PACS for prior studies, perform image verification, and close patient exams from the mobile. Also on display was the Auto-Positioning Overhead Radiography System (pending 510(k)) developed by Virtual Imaging, Inc., a wholly owned subsidiary of Canon U.S. A., comes with automatic motorized positioning and featuring automatic stitching, a 10-in touch screen by the tube, a vertical wall stand, and a table with extended range of motion. It is anticipated that this system will be outfitted with a variety of Canon wireless DR Systems, including the CXDI-70C Wireless and CXDI-401G detectors, and the Canon CXDI Control Software NE. FUJIFILM Medical Systems U.S.A., Inc introduced its recently FDA 510(k) cleared gadolinium and cesium digital x-ray (DR) detectors for pediatric use. These DR systems are designed to provide safe, low-dose pediatric imaging. The units range in sizes from: 24 × 30 cm, 14 × 17 and 17 × 17 cm. The smallest format, a 24 × 30-cm cesium iodide detector, is specifically designed to offer high DQE performance for low dose x-ray exams, such as for small patients and anatomy such as extremities, shoulders, c-spines and more. The company also highlighted its new floor-mounted digital x-ray system, the new FDR D-EVO Suite FS, which is a space-saving DR room solution, built for reliability and performance to handle the busiest radiology departments. The system can also be used with FCR on demand. The new complete room system offers lower cost room preparation, fits into smaller rooms, and rooms with low ceiling heights. It is designed for high productivity with just the right mix of grab and go workflow and integrated automation. GE Healthcare’s clinical application for its fixed radiographic system, VolumeRAD, offers improved detection and management of patients with lung nodules compared to conventional X-ray imaging of the chest. As the first thoracic radiographic tomosynthesis product witha specific indication, this advanced application aims to improve the detection of lung nodules and the subsequent management of patients. VolumeRAD is GE’s breakthrough X-ray application that provides physicians with multiple high-resolution slice images of the anatomy of interest, including the chest, abdomen, extremities, and spine. This advanced clinical feature is a method of acquiring a series of low-dose projection images during a single sweep of the x-ray tube over a limited angle. Konica Minolta introduced its AeroDR 10 x 12-inch wireless digital radiography (DR) detector with a new plate designed for sites seeking a smaller and lighter wireless flat panel for use in general x-ray and specialty applications. The detector fits most bassinets in the newborn intensive care unit and can be used with major portable x-ray systems from various manufacturers, the company added. In addition tomost standard digital imaging requirements, the plate can be used for cross-table, extremity, and sunrise patella views with a high tolerance to patient weight loading. The new plate is similar to the AeroDR 14 x 17-inch and 17 x 17-inch plates in that images appear on the console display in less than two seconds and it has the same lithium ion capacitor. Hologic’s SE Femur Exam capability is offered exclusively on the new Hologic Horizon DXA system for the assessment of features associated with atypical femur fracture (AFF). This first-of-its-kind capability assists clinicians in their identification of potential AFFs inpatients who have been on anti-resorptive treatments such as bisphosphonates. The 15-second SE Femur Exam is designed to produce a high-resolution image of the entire femur with a very low effective radiation dose. Philips MobileDiagnost wDR provides premium solutions for quality images, delivering digital radiography where and when it is needed.Clinicians receive the same excellent image quality and improved workflow efficiency of a Philips premium digital radiography room in a flexible mobile X-ray system. Philips PrimaryDiagnost DR consists of a tethered portable detector that works in the X-ray table, on the vertical stand and for free exposures. It is managed by the intuitive Eleva user interface and requires only three clicks to complete an X-ray examination. The geometry can be adapted quickly for sitting, standing and supine patients in various positions to support a wide range of DR applications. All components are counterbalanced for easy manual movement and can be placed around the patient. 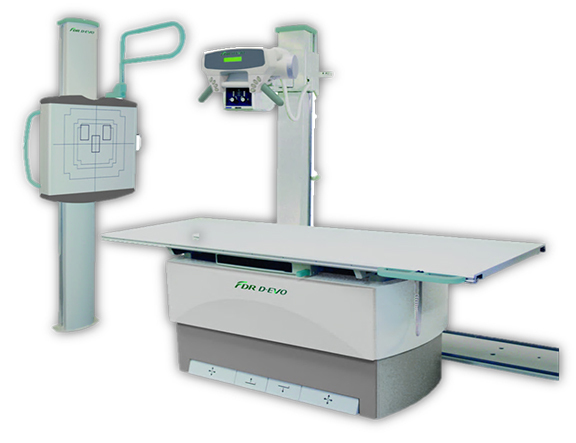 The Siemens HealthcareYsio Max digital radiography system has a family of new detectors: MAX wi-D, a light, thin, and fast wireless 35 × 43 cm/14 × 17 inch detector with a handle; and MAX mini, a 24 × 30 cm/10 × 12 inch wireless detector dedicated for orthopedic,pediatric, and trauma cases. Ysio Max also boasts MAXalign — a feature designed to display the detector angle on the system’s touch display, enabling the technologist to achieve the correct tube angle according to the detector angle. Using this feature, the technologist can, for example, take chest images in bed without the need for a second X-ray image. The Ysio Max also has MAXswap — one-click registration designed for easier, faster, and safer detector sharing with the MAX mini and MAX wi-D detectors. The Ysio Max’s system positioning,FAST (Free Axis Simultaneous Travel), is designed so that the system automatically takes the fastest, safest way to the desired position. Viztek showcased its high-performance dual-detector digital x-ray system FIT-DR, which delivers efficiency via fast throughput and high image quality at an affordable price. With two high-quality cesium detectors, the FIT-DR is able to accommodate a full repertoire of x-ray exams without repositioning the patient, which places less stress on the patient, as well as the technologists. It also minimizes the risk of detector damage due to less frequent handling of DR panels. The solution, suitable for both new and retrofit installations, provides facilities the option toconvert to DR in an easy and cost-effective manner, with a fixed panel for the upright unit and wireless DR panel for the table system. 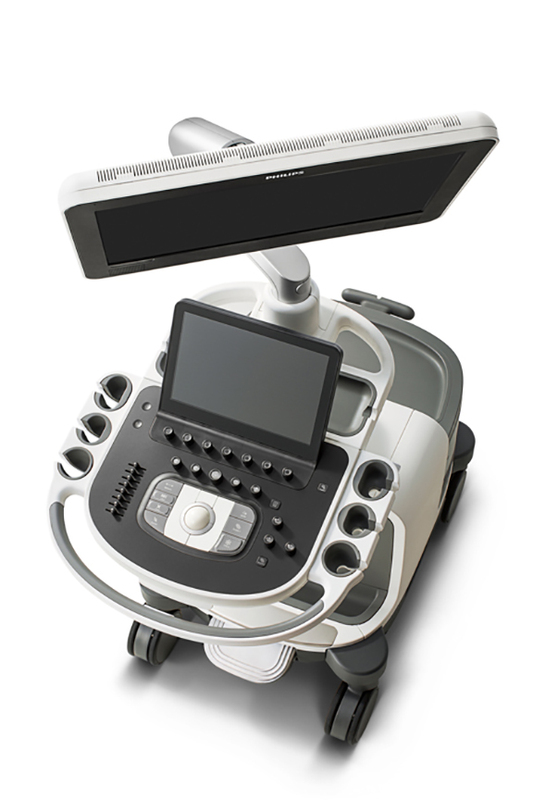 GE Healthcare featured Invenia ABUS automated breast ultrasound (ABUS). GE’s new features on the LOGIQ S8 general imaging ultrasound system focus on image quality and streamlined workflow for healthcare providers and shortens exam times for patients. GE’s new suite of software and productivity tools on the LOGIQ S8 deliver enhanced scan efficiencies and imaging capabilities. Compare Assistant allows clinicians to display DICOM compatible images —ultrasound, mammogram, CT or MR—directly on the ultrasound monitor before or during an exam to plan the scanning approach. This software tool has the capability to standardize imaging protocols, expedite exam preparation and planning and provides interpreting physicians with comparative views. FUJIFILM SonoSite highlighted resolution ultrasound kiosk, the X-Porte, designed to cure side-lobe imaging artifacts, through a new type of technology never before used in an ultrasound system: SonoSite’s proprietary Extreme Definition Imaging (XDI). XDI is a new beam-forming algorithm that significantly reduces the visual clutter from side-lobes that affect all ultrasound products regardless of system size. The resulting ultrasound image appears cleaner with optimal tissue differentiation. Konica Minolta announced the launch of Sonimage P3, an ultrasound system that brings advanced imaging capabilities right to the patient or bedside. The personal ultrasound device can be carried in a lab coat or worn like a stethoscope for real-time patient diagnosis at the point of care—in triage situations, outpatient/office, or on any hospital bed floor. Providing high image quality, this durable palm-sized device weights less than 14 ounces and offers B-mode, M-mode, Doppler, and simple to access presets. 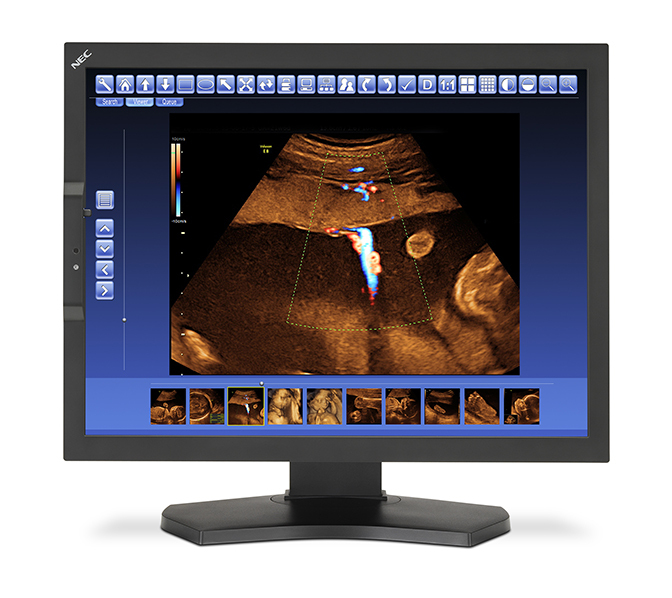 Clinical applications include fetal/pregnancy assessments, and abdominal, lung and pelvic examinations and the Sonimage P3 can be used as a stand-alone ultrasound system or plugged into a Windows-based PC, laptop or tablet for the flexibility of a larger display. Philips unveiled EPIQ, a premium ultrasound designed with enhanced clinical information and faster, more consistent exams that are easier to perform. EPIQ’s combination of nSIGHT Imaging and PureWave transducers provides the clinical information to make a definitive diagnosis, even on technically difficult patients. The system’s panoramic volume imaging uses Live xPlane imaging to acquire a calibrated volume imaging to acquire a calibrated volume over an extended field of view. EPIQ’s Anatomical Intelligence elevates ultrasound from apassive to an active device with advanced organ modeling, image slicing and proven. 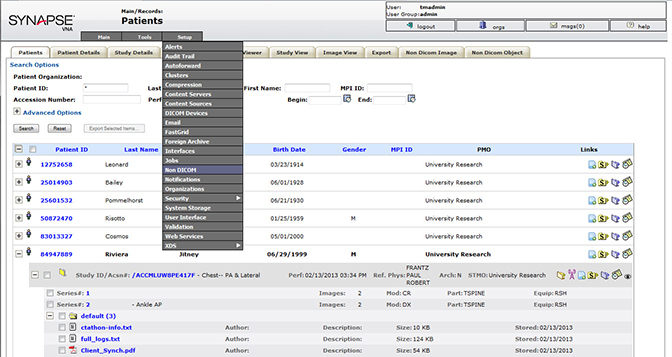 The system also has a multimodality query retrieves platform for viewing DICOM images. Samsung Electronics America, Inc. continues to build its presence in the radiology space by expanding its UGEO lineup to complement existing Samsung Medison Ultrasound systems. The company displayed Accuvix A30, Samsung Medison’s advanced ultrasound system now featuring Fetal Realistic View rendering technology; the UGEO H60, providing advanced imaging in a compact, ergonomic design;the SonoAce R7, a compact system providing full spectrum imaging for greater diagnostic confidence; the UGEO PT60A, Samsung’s first tablet-based ultrasound system, with performance, compact size, and ease of use for Point-of-Care applications; and the UGEO HM70A, anew high-end hand held system. Siemens HELX Evolution ultrasound system is powered by the new SieStream HD system architecture to offer HD image quality, streamlined workflow, and cost-effective sustainability and upgradability. Featuring new transducers, more powerful image processing, anda 21.5-inch LCD monitor with a 60% larger image area, all ACUSON S Family systems provide 50% greater pixel density and 20% greater image visibility in PACS. Siemens’ elastography and tissue strain technologies are further enhanced with the HELX Evolution. Virtual Touch imaging (VTi), Virtual Touch quantification (VTq),10 Virtual Touch IQ (VTIQ) as well as eSie Touch elasticity imaging enable visualizing and measuring tissue stiffness, allowing clinicians to evaluate anatomy more clearly. With ARFI-based VTIQ, physicians have the ability to quantifiably assess the stiffness of tissue in small parts, such as the breast and thyroid. Numerical values are shown simultaneously against a qualitative color map over a user-defined region of interest, providing greater detail about abnormalities within tissue. Previously available exclusively on the ACUSON S3000 system, VTIQ is now offered on the ACUSON S2000 system HELX Evolution. Zonare introduced the new L20-5 ultrasound transducer with a 32-mm aperture and up to 5-cm penetration. It supports B-Mode, compounded harmonics, spatial compounded harmonics CD-Mode, PDI, dPDI, PW-Mode, HPRF, M-Mode, elastography and CEUS. It provides excellent imaging for pediatric, musculoskeletal, breast, testicle, interventional, vascular, contrast enhanced ultrasound (CEUS),advanced research and other applications. The transducer is based on ZONE Sonography Technology (ZST), an approach to echo data acquisition and image formation. Using a small number of large “zones,” ZST acquires ultrasound data up to 10 times faster than conventional ultrasound and extracts more information on each transmit receive cycle. Since the speed of sound traveling through tissue is a physical constant, ZST has a significantly faster acoustic acquisition time enabling superior imaging quality. 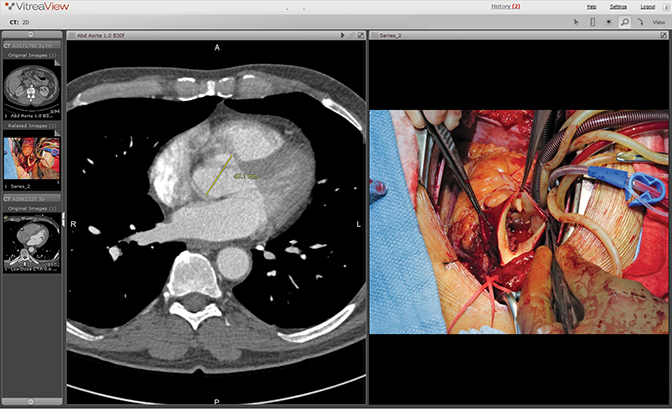 RSNA 2013 review: Technologies that empower partnerships. Appl Radiol.